“Sister Jonette is highly respected and loved by the physicians, staff and especially the patients whose lives she has touched over the years,” wrote Carolyn Friese, Assistant Administrator and Nurse Executive at St. Vincent. “She has been a personal and professional inspiration to me and it is because of her that we have a renal dialysis program,” Carolyn added. “We value her so deeply that we have created the Sister Jonette Fund that acknowledges nurses who have gone beyond normal expectations,” she said. “For the past 32 years I have learned from her…her enthusiasm is energizing, her stories endless and her love of her profession is evident as she cares for patients and the people who care for them,” explained Kathy Castelaz, Director of Medical/Surgical ICU and Intermediate Care Unit. “I continue to learn from her and she has a special place in my life and my heart,” she added. 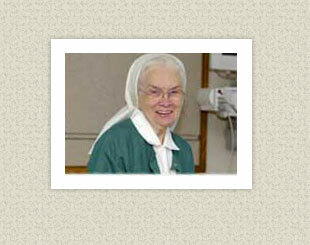 “I have had the opportunity to know Sr. Jonette since 1971,” wrote Shirley Fox, Risk Management Director. “Her knowledge, commitment and tireless hours to patient care either through ‘hands on care’ or education of the staff has always been an inspiration to me,” Shirley added. Other co-workers wrote similar messages. “She is an inspiration to us all at the Dialysis Unit and her wisdom and expertise is something to be admired,” said Patricia Bekkers, RN. “Sister Jonette has been mentoring me for three years and she has a wealth of knowledge and shares it freely,” explained Bonnie DeJardin, RN. Catherine Ann Devlin was born on June 17 in Springfield, IL. “I am the oldest of three – I have one brother and sister,” Sister Jonette explained. Their cousin, whom they considered their oldest sister, was seventeen years older and lived with the family. In addition, their uncle, who farmed with their father, lived with the family along with each of their grandmothers who spent their last years with the family. “I am very proud of my Irish heritage and being from the farm as I loved outdoor work,” she explained. “I can still recall the first tractor my dad purchased and, of course, I drove it,” she said. “Coming from Irish heritage, families are very close especially in those days,” she explained. “Family reunions consisted of extended families from a distance and Sundays and family get-togethers were very special. People worked very hard, but life was simple and religion was important in the family life. I can even recall that you never attended a basketball game during Lent unless you went to the Lenten service first,” she added. She attended a one-room grade school and high school that was ten miles from her home. The school bus was a cab from a truck with a tin building on a platform where the seats were. She always wanted to be a nurse and so upon completing high school she entered St. John’s Hospital School of Nursing. Most of the instructors were Sisters and there were at least two on every floor. One Sunday, a group of freshman was invited to the Motherhouse and seeing the Chapel and Church made a significant impression. “It appeared that the painting of Christ behind the altar in Church with his arm outstretched was saying ‘Come to me’ and after several weeks of praying, I decided to enter the Hospital Sisters in 1946. My Irish family was very concerned I was in a Community with a German background,” she said with a smile. “I admit it was very hard leaving my family and farm life but God’s ways are not known to us,” she explained. She professed her final vows in 1954. She is a graduate of St. John’s School of Nursing and received a BSN and MSN degree from St. Louis University. Throughout her nursing career, Sister Jonette has worked in two cities – Springfield, IL and Green Bay. She briefly served as a nurse at the Motherhouse and was head nurse at St. John’s Hospital and later was Clinical Instructor/Supervisor/Head Nurse-ICU at St. John’s from 1954-1969. “It is unbelievable the changes I’ve seen in nursing,” she explained. “I think back to the days where you hand sharpened needles before sterilization to now as shots are administered with disposable needles…it’s truly amazing,” she added. Mark, a four pound, two-month old baby boy, was admitted on December 26, 1968 to the adult ICU with severe respiratory problems. He had been in the NICU but was discharged a few days before Christmas. Upon admission, he was intubated and placed on a respirator (which was rare for a child that size in 1968). Even though in an incubator, it was difficult maintaining a normal temperature for a baby. Sister Jonette and the other nurses were very nervous caring for Mark “but God was watching over us and heard the prayers of a very strong faith-filled Lutheran family. As nurses, we were very nervous caring for little Mark, but God was watching over us and hearing the prayers of the family. Doctors would often say he really doesn’t have a chance and probably would be blind but we began to notice that his eyes seemed to focus on the crucifix hanging on the wall and mobile on his crib. As time progressed, he was placed in a seat in the crib and would smile. The day finally came when a tracheotomy was performed and soon the nurses were able to wean Mark from the respirator. This was followed by being able to remove him from the crib and hold him. Five months from admission, Mark was discharged with his tracheotomy and continuous oxygen. This was a sad day for Sister Jonette and the other nurses as they became very attached to him. Today, Mark Phillips is married and is a father of two. He wrote that “Sister Jonette’s love and compassion for patients shows through her care giving. For me, I am thankful for having her as part of my life because she was my guardian angel at a time when I need her most,” Mark said. For Sister Jonette, this relationship has been a wonderful example of seeing God’s hand through her work and her profession as a Sister and nurse. Today, her dedication continues in the same Franciscan spirit. “Since that time my years have been carrying for God’s children and teaching in the clinical field,” Sister Jonette said. “Nursing really brings life to a full meaning as you witness the beginning of life and end of life going back to our heavenly Father,” she added. “You have many saints you call upon to aid you as you hold life in your hands,” she continued. “Our Lord has blessed me in many ways in which I am thankful,” she concluded.